Bhagavata Purana (भागवतपुराण), also known as Srimad Bhagavatam means Divine-Eternal tales of Supreme God, with its focus on bhakti (religious devotion) to Supreme God Vishnu (Narayana), primarily focusing on Lord Krishna, who lived on earth around 3200 BCE. It was the first Purana to be translated into a European language, with three French translations made also between 1840 and 1857. The writing credit has been given to Sage Veda Vyas and it states that when the Sun comes to Mesha Rasi (Aries), there are equal day and night. It shows that then vernal equinox was at 30 degrees. At present it is almost at 336 degrees. So, the vernal equinox has receded back by 54 degrees. The rate of the precession of equinoxes is 72 years per degree. Multiplying 54 by 72 we get 3888 years ago when Bhagvata Purana must have been written. So, it must have been composed around 1800 BCE and in that ancient era, lot of scientific knowledge existed. Bhagavata at 1-5-33, describes a method of treating diseases, which is similar to present day’s Homeopathy. Dinosaur, Krukalasa was mentioned in Bhagavata Purana, who was killed by Krishna. Theory of Relativity, Time Travel incidents like Kakudmi and his daughter Revati, were recorded in Bhagavata along with story of King Muchukunda‘s story in which a indo-greek warrior was killed. Abhijit or Vega is a star whose Deity is Brahma (creator). So, Kakudmi and Revati must have gone to a planet around the star Vega which is 26 light years away from the earth. Recently Russian scientists have discovered that there is a planet around Vega which may have life. Entire science of Embryology was described in detail by author of this book. Modern science has discovered all that to be true after 1972, following the research of Dr.Robinson of England. Bhagavata also states that, till end of 6th month, soul keeps travelling in and out of womb and revolves around its future mother. But in the 7th month, it enters womb and the foetus remembers everything in the past birth, but forgets due to compression during delivery. This is unknown to the modern embryology, but is true. Modern science has discovered in 1925 [McNally’s paper] and 1935 [Ross and Tait] that the vestibular apparatus or Labyrinth in the internal ear is responsible for the sense of directions. But Bhagavata has mentioned this detail around 1800 BCE. How could Vyasa find that minute device situated deep in a human skull ? Bhagavata also mentions how God realised that unless He and She unite they were unable to reproduce. So he conjugated with her. He entered into her 23 principles. Those 23 principles were activated by his energy and they conjugated with his 23 principles. With that conjugation a person came into being. These 23 principles (gunavidhi), which are the 23 chromosomes present in human being. They combine with each other to form a zygote. Bhagavata also states that he divided himself once, ten times, three times. The zygote divides itself once to produce two cells. This happened ten times so 2 raised to 10 cells appeared. This took place at three layers, namely entoderm, mesoderm and ectoderm, producing 2 raised to 30 cells. Modern science has discovered recently that so many cells are really found in the newborn baby. Knowledge of Atom, electrons, protons, neutrons etc existed in those days. Distance between a proton and an electron is 50000 times the diameter of proton. Diameter of the orbit of electron around an atom’s nucleus is 50000 times greater than the diameter of an electron or proton. Thus the description of Paramanus or subatomic particles as given in the Bhagwata is perfectly matching with discovery of modern science. 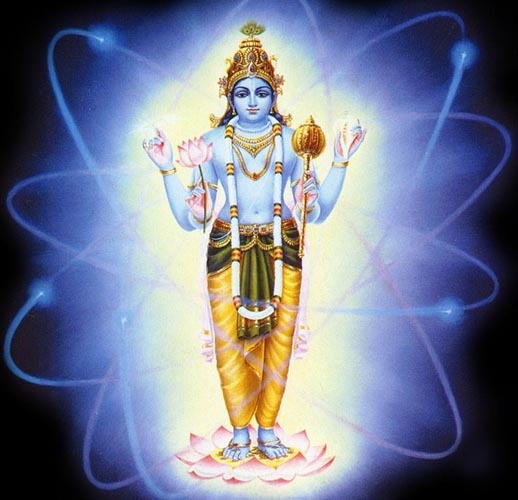 Human cloning is still not achieved by modern science but Bhagavata tells a story of how Cloning was done for King Vena to produce his replica, Prithu, who became guardian of Earth (Prithvi). The story of Tripurasuras being killed by Siva with a guided missile, helped by Vishnu (not Krishna), how Narakasura was killed by Vishnu (not Krishna) are few twisted tales in this book to glorify Krishna. Narakasura was a remote ancestor of Bhagadatta who fought in the Mahabharata war taking the side of Kauravas. Krishna, who was contemporary to Bhagadatta could not have killed Narakasura in his era. King Bali’s story is also twisted to some extent. Bhagavata states that Vishnu came in form a Wamana and stepped on 2 places (Earth and Sky) and placed 3rd step on Bali’s head to crush him to Paatala (underworld). But infact, Wamana demanded tri-pada Bhumi from Bali. Pada means a quadrant or one-fourth of a sphere. Earth is spherical. Its three quadrants mean three continents known then, namely Asia, Europe and Africa, which were rules by Bali. He donated them to Wamana and left out to find other place for habitat. The newly found place was America, which is underworld (for being on opposite site of earth to India, so it can be reached either by travelling through a tunnel from India or by Air). Bali resided and colonized America. He was given a boon by Wamana that he will become future Indra (lord of gods) in Savarni Manvantara. Thus, American continents (specifically Central and South America) are Paatala for India. Bhagavata is a resource of knowledge with examples like gemstones being discovered under earth and sea. ‘Airawata‘, the white celestial elephant emerging out of ocean etc. National Academy of Sciences has recorded Australian research that ancestors of elephants were aquatic animals as proved by fossil and molecular studies. Elephant embryos of 58 to 166 days show Nephrotomes which are characteristic of fish and frogs of fresh waters. Mammals never possess nephrotomes.Then how elephant embryoes possess nephrotomes ? Because elephants were aquatic. They used tubes for respiration which are converted into trunks now after thousands of years of evolution and adaptation.